Christina Aguilera was in this green gown when singing the song “Bound to You” in Burlesque movie. The young singer looked Stunning wearing this green silk like satin dress ! Q: Hi, is it possible to make the waistline at the natural waist rather than the hip? Additionally, could you send me photos of what the dress would look like in white or ivory? If not just send as many colors as you have. Thank you!! A: Dear, Yes, we can make the waistline at the natural waist rather than the hip. Please include your request in your order comment. You will be able to leave a comment at the last step checking out before making payment. We just sent the pictures to your email. Please check them. Thank you for contacting us. Q: Hi, would it be possible to see examples of what the dark green and black would look like on the dress? A: Dear Faith, Sorry, we don't have the pictures of the dress in dark green and black now. Thank you for your interest. A: Dear Camille, We just sent the pictures to your email. Please check them. Thank you for your interest. A: Dear Georg, Sorry, we don't have the plain photo of the dress now. We just sent the pictures of our customers in this dress to your email. Please check them. Thank you for contacting us! A: Hello, We just sent the pictures to your email. Please check them. Thank you for contacting us! A: Dear Lucy, We just sent the pictures to your email. Please check them. Thank you for your interest. Q: Hi do you think you could send me pictures of this in red and if so on a consumer ? Thanks ! A: Dear Tallulah, Please check the pictures of our customer in this dress in attachments. Thank you for contacting us! Q: Can you please send me pictures of this dress on customers? A: Hello Penelope, We just sent the pictures to your email. Please check them. Thank you for contacting us! Q: can a train be added to the dress? A: Hello, We can make the dress with a train.Please include your request in your order comment. You will be able to leave a comment at the last step checking out before making payment. Thank you for contacting us. A: Hello Brenleigh, We just sent the pictures to your email. Please check them. Thank you for your interest. I ordered my dress on a Thursday and it was shipped to Australia on the Sunday and delivered straight to my house on Monday. I am so impressed with the quality of the material and the beautiful silhouette that this dress created for me. It is exactly like the picture - I ordered it in green and the likeness is astonishing! It is silky smooth on your skin and just the right length so you're not tripping over the material. Thank you so much for the excellent service and craftsmanship of your dresses, will definitely be buying from here in the near future! I was ecstatic to find this dress! I always admired this dress when watching "Burlesque". After reading all of the wonderful reviews I knew it would be safe to order it. I chose to have the dress custom made to my size, and overall it fits pretty well. The bodice is slightly large, and my thighs are a little tight in the skirt. I'd say it is definitely worth the extra $9.00, but I do recommend adding a side note if you have larger thighs, or a larger bum. On the other hand, the material is absolutely gorgeous. I had high-expectations of their claims of it being "silk like satin" and it truly is great quality! I ordered it in "Navy", and it is the perfect colour! Finally, shipping was extremely fast. I ordered my custom dress on March 6th, and it arrived on March 14th. WOW! Overall, this dress is very good quality and design for its price point, and is very flattering with its shape. So many thanks to our lovely customer for sharing her beautiful picture. So many thanks to our customer to share her beautiful photos.So So stunning. I am so happy with the dress I got! My prom was amazing because of it! It was perfect! 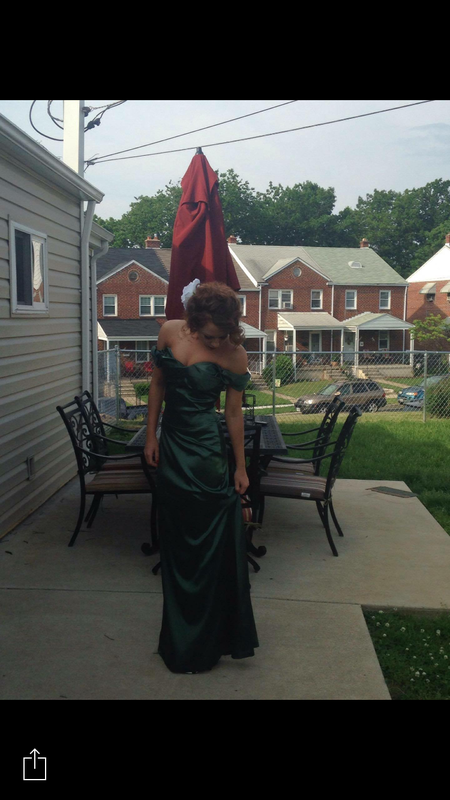 It fit exactly the way I imagined and it was actually really comfortable thank you again for such an amazing dress! I would definitely shop for one here again! Btw the exact measurements especially for someone who is along the smaller side TOTALLY WORTH IT! Got my dress today amazing fabric is great quality, postage was fast. The dress is a great fit only a tiny bit big around the hips but nothing that cant be altered which is good. Shipping was great very fast considering im in New Zealand. very excited to wear this to my school ball. I got my dress last week. I am soooo impressed with my dress now that it is here!! The price was AMAZING! The dress is GORGEOUS, the fabric is good quality, the craftmanship is PERFECT. The production time was AMAZING - it was only 16 days from when I ordered the dress until I had it in my hands! I just cannot say enough wonderful things about your company, I have told everyone I know what a great value dresses from your company are. Thank you so much!! i found the dress beautifully made and a great fit. i and four others bought the same dress and all are exactly the same. the color and fabric make the dress glow with radiance. it flows well and looks great on stage. i want to thank you for create such a great and useful dress LoL..
Can this be made into a maternity dress? I would love to buy this, but I am wondering if it could be possible to get it made with maternity measurements. My email is raspberrymidwife@gmail.com. Can someone let me know if that is possible? 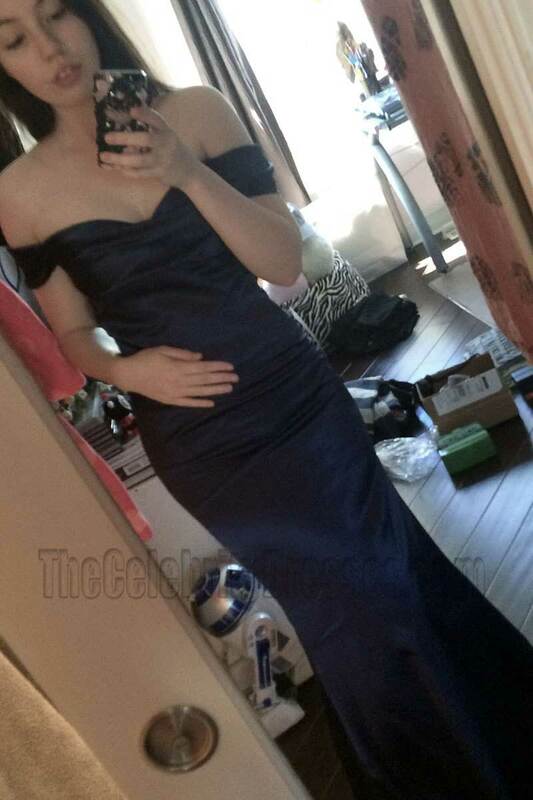 I wore this dress in black to my formal and it was absolutely stunning! I was a bit nervous about ordering on line but when I learnt you could order the dress in any color and have it custom sized I was so excited! The dress arrived about 2 and a half weeks after I ordered it and the quality was amazing! The dress is made of beautiful fabric, the seams are flawless , the off-the-shoulder design is what I like so much . I was extremely happy with the dress and would recommend this site to anyone! Thank you!